It only takes one. One person, that is it. One person besides me, that is. I have observed different groups of Nia students and I have seen them alter their sounding practices. It is so fun to witness a silent class become noisy. I feel that making noises in a dance exercise class, or “sounding” as it is called in Nia, depends a lot on the music. There is specific music that just lends itself to making noise. There is some music that people instinctively just join in singing or making the appropriate sounds during the music. There is also specific moves that lend themselves to sounding. Chopping seems to cause “Hi-yas!” to erupt from the practitioner. Blocking tends to cause loud “Has!” But not all the time. It does help when they are made a part of the choreography. It helps when the sound is the same or at least consistent throughout the song. My sounding often just comes out. I am dancing to the music and perhaps thinking of the next move or discovering a pearl and noise just comes out. It is not always the same as the last time. I feel that sometimes makes people shy. They want to have others saying it with them. And it really only takes one. That ONE person who seems to just have noises inside that have to come out. That one person who doesn’t need the teacher to lead them. That one person to just make a noise and it encourages others to do so. I often feel that there are some that want to make noise, but they don’t. There are many reasons people don’t make noise. I think I mentioned it before, but I kind of remember it being a “thing”. I am not saying we were told NOT to make noise, but you would never have walked into a women’s gym and heard grunting. (Eye roll) I guess that is because we aren’t allowed to breathe. HA. I don’t know, but I do have a sense that it was not something women were encouraged to do. Exercise was done in silence. So I think that has a lot to do with it. We were not taught to make noise while exercising. So we don’t. But I sense there are those that want to. What I see happening, is we will do the move with me making the noise for seven times. The eighth time comes around and since we are changing to a different move I might be at the point when I need to use that time for instruction. It just happens that on that eighth time the person finally got up their nerve to make a sound and then it is as if they are left hanging because I didn’t do it with them because I had to introduce the change. Yup . . . I feel that happens a lot. But not when there is that ONE person. All it takes is ONE person. That one person can — by example — encourage the rest of the group. I love it. I silently cheer that person on. I send waves of gratitude out to that one person that is not me that is sounding and helping the group find their voice. I have some GREAT sounders in my Nia groups. And I am so happy and excited that they are finding their voice. I know how it is to move silently through a class. Nia is wonderful and freeing, so the dance is meditation to me. But when I first decided to join in on that sounding — YEOWZZZAAAA! Whoa! That just took the movement, the dance, the freedom to an entirely different level. It was invigorating. So I know how it is to be shy about making noises in class (I know if you have ever taken my class you might not believe that). I know how it is to take up almost the entire song before you allow that sound out. But I also know how it FEELS and the senses my body experiences after a really loud and noisy class. So I will keep sending out waves of applause to that one sounder as they lead the entire class into becoming sounders. Do you make noise when you work out? Perhaps you sing? Do you breathe loudly? We have sounding in Nia . . . where we make sounds as we are dancing. Plus people are always invited and . . . in my class . . . encouraged to sing. I’ve written several posts about sounding and put them in their own category under Nia. (Click here for the link to those posts) Although I do not think of making sounds as being regulated to Nia, I just have them as a sub-category under the category Nia. I think sounds are appropriate to make during other exercises and workouts. One that always comes to mind when people seem to need convincing of making noises and exercising is martial arts. Once I remind them that “Hi-Ya!” is a common sound, they seem to relax into the idea a bit. As I probably have mentioned before, I remember it being an unspoken rule that you didn’t make noise while you are doing Jazzercise, lifting weights, or working out at the Lady Spa. Could have been ideal that it was unladylike to make noise. I don’t know, because I never remember being told NOT to make a sound, I just know that no one did it. It was almost as if even breathing heavy was taboo! One reason I love Nia: breathing and making sounds are encouraged. But I think of these sounds as helping with the flow of oxygen and energy. I think of them as stress relieving and joy bringing. So when I was flipping through Yoga Journal and came across an article titled “How To Be Fearless” I thought, “Huh? Interesting.” Mark Moliterno, an opera singer and yoga instructor has paired yoga with voice to create YogaVoice. This reminded me of one of Nia’s instructors who created Kivo® The Kinetic Voice . . . which is – according to her website – “a vocal practice that uses the whole body. It is designed to harness the power of vocal vibration and movement as transformational tools that unlock energy, activate your true radiance and empower you to go out and create the life you were born to live.” So . . . back to the article when I looked at the chart within the article I realized that the pairings were for more than just overcoming public speaking jitters as the subtitle read. It was for a list of different areas. Just as we know certain sounds to be related to certain chakras and feelings, you probably also know poses are related to certain chakras and feelings. When sounds and asanas are paired up they can be very beneficial. I would bet many of you are familiar with “OM” as a yoga chant. Different sounds and different mantras can be used. The information on the YogaVoice websites leads me to believe this is different from chanting while doing yoga, there are indications that it goes beyond that. I just love that more sounding is coming into the workout. Since I believe there is a lot more to sounding — a lot more benefits can be reaped than just breathing — I love movement forms that stem from sounding or that incorporate it. Do you believe the is benefits to making noises while working out? Do you make noises while exercising? There are a few posts on my blog about sounding in Nia. I even have a separate category for it. See over there to the left under categories, under Nia? Sounding is what we call making noise in a Nia class. Sounding is great for many reasons. Sounding is a release. It can help release tension, emotions, spirit . . . whatever needs “releasing”. Sounding is fun. Sounding can assist in the stabilization of the torso. Sounding can help ground you . . . physically, emotionally, and your spirit. Often times when I am doing Nia both when I am teaching and when I am a student, my spirit just makes a sound. I don’t plan it, I don’t think about it, a noise just comes out. I “woo” a lot. But sometimes other sounds comes out. Sometimes the sound I make makes me laugh because I really don’t think about the sound, something just comes out. I could be thinking of something, for example, maybe the move we are doing reminds me of a swirling skirt, so then the sound could be a “whosh” as in the sound of a skirt, or it could be a giggle of a girl twirling in a skirt. I don’t always think about the sound I just let it out. Sometimes I do think of the sound. Sounding can be purposeful. The noise can have a purpose. I have posted about healing sounds and sounds associated with the chakras. This post is about the sounds that are associated with Nia stances, which are part of Nia’s 52 moves. The picture in this post is an approximation of how MY feet would be placed in the various stances. Remember that your stances would probably be slightly different. The width would be according to YOUR body and your body’s way. The picture is just to give you an idea and maybe help remind you of the various stances. At this time I have a post associated with four of the six stances. In Nia’s closed stance the sound is the vowel sound “o”. The sound is made to “create volume in your chest cavity”. In Nia’s open stance the sound is (to say) “balance” or “ground”. Saying the word “balance” can assist you in your balance. The word “ground” can assist with allowing you to feel grounded and sense balance. The sound for Nia’s “A” stance is “aaaaahh!”. You say it on an exhale. Letting out all your breath until you are ready to inhale. 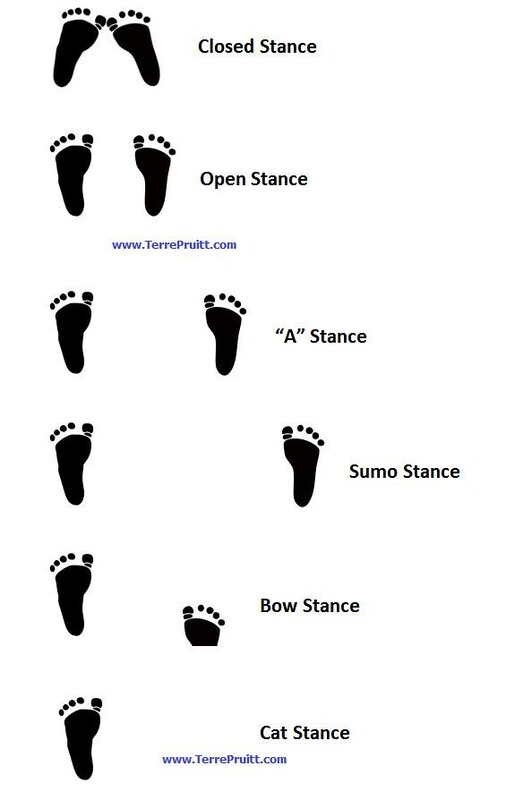 Sumo stance or riding stance (feet as wide apart as if you were riding a horse) has an explosive sound. Say “ha!” To me this helps with stabilization. The bow stance has a sound of “u”. The bow stance is done with either foot in front, not just with the left foot in front as shown in the example. The cat stance (standing on one foot, with the other foot pressed against the standing leg) has the sound “wooooooo” associated with it. This is done on the exhale. This stance is also done on the other foot and not just the left one as in the example. So as you are practicing the Nia stances you can use the sounds associated with them for added benefit and fun. It is just fun to make noise. To me it adds to the experience. In my classes I encourage people to make any noise they want. I also like to play with the noises, sounds, and words associated with the move. Do you attend a dance exercise class or exercise that encourages you to make noise? Information regarding the sounds made with the Nia stances can be found in The Nia Technique book written by Debbie Rosas and Carlos Rosas (NKA, Carlos AyaRosas). The book can be purchased from Amazon. I’ve post about the Healings Sounds. I’ve posted about how we used the Healing Sounds in our Nia class. I’ve stated that making noise is a great way for people to know that you are breathing. There are other reasons to sound, one being it helps stabilize your core. In Nia or in other dance exercise classes there are times when you are moving and playing with balance so having a stable core can assist in proper balance. With the effort to stay stable there is also strengthening. On the exhale the abdomen is tightened. In Nia we do a lot of movement where core stabilization is key. Some of the moves we do that require a stable core are punches, blocks, and kicks. In order to punch and/or block with strength and authority the spine needs to be straight, the ribs squeezing, and the abs tight. All of this can be accomplished with one loud sound, any sound can do it. Kicking is the same thing, even if you are doing a side kick where your body might be leaning, the spine is still straight and the torso needs to be tight. A joyful “HA!” can take care of all that! Another reason to sound is release. We are often taught to be quiet. It could be as deep and as damaging as we were taught our opinions don’t matter. It could be more of a social “norm” where we were taught to respectfully keep one’s opinion to oneself or respectfully not sing, shout, or cry out loud because it would be inappropriate even though that is what we really want to do. All of these social confines can lead to blocked energies. Having to behave can lead to us feeling bad, so sounding in a Nia Class is a huge release. We can experience a release. Healing sounds aren’t the only ones to be made, anything will do. Often times for me I am busy with listening to the music, thinking of the next move, getting ready to cue, dancing, and breathing I don’t THINK about sound it just comes out. Sometimes a move makes its own sound. Also depends on the move. I did a routine recently where the moves were very quiet for me. It was odd. It was as if the moves had no sound. I am wondering if that is because it was so new. I am looking forward to doing it again to see if sounds reveal themselves. In addition to breath, stabilization, strength, and release sounding is fun. Children are expected to shout, laugh out loud, and be joyfully noisy, but adults not so much. Kids can run and scream on a playground, adult aren’t often afforded such a luxury, but in Nia we can. It really is fun. It is fun to make noise. 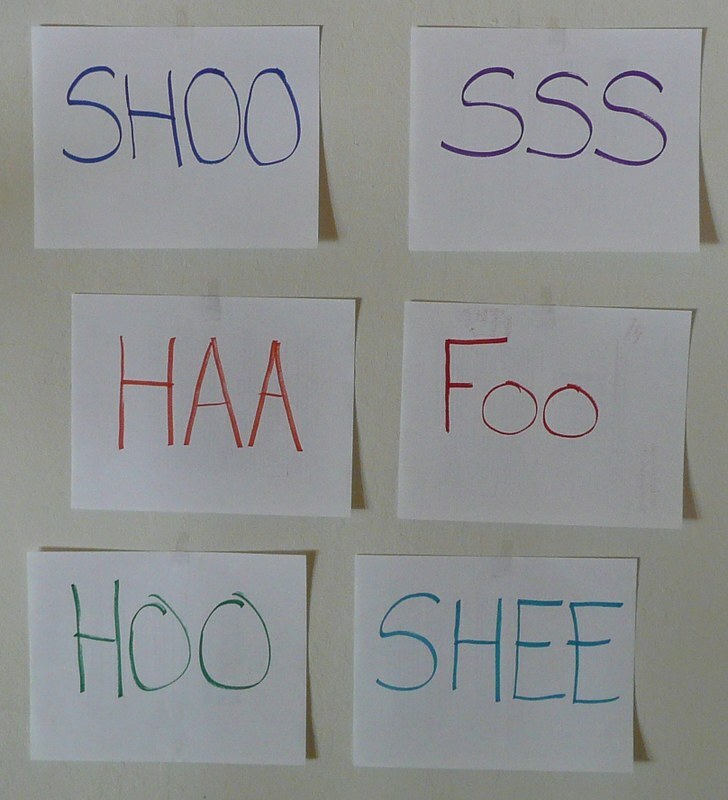 It is fun to HA, HOO, FOO, SHOO, HI-YA, WAHOO, WHOOO, and SHHHHH to the top of your voice. It is fun to play with the volume and the tone of the noises. All of this playfulness adds to the joy. We can whoop it up as we did when we were young. The vibrations of sound heal the body. The fun heal the spirit and the soul. I often wonder how people are able to keep quiet in a Nia class. I believe they have not yet experienced the good it will do for them. There is the breath, the added stabilization, the strengthening, the emotional release, and the fun that it brings all good for the body, mind, spirit, and soul. While I am saying we do sounding in Nia class, don’t think it is restricted to that. So while you are exercising don’t forget to breath. Try making some noise. If you are in a class that doesn’t allow for it find a Nia class and whoop it up there! Do you make noise while you exercise?